Enjoy the gallery below where you can view photos of some of the smiles we have helped to improve! 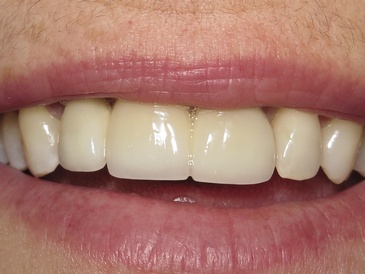 Porcelain veneers placed on the front 4 teeth with minimal tooth structure removal. 4 years in and the polish and shine of the veneers are still present. Patient broke the Palatal cusp off his second premolar. A same day CAD/CAM (Computer Assisted Design/Computer Assisted Milling) Porcelain Crown was treatment planned. 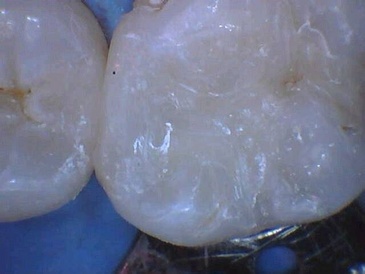 Figure 2 shows how much of the tooth structure we were able to conserve by doing a same day crown. 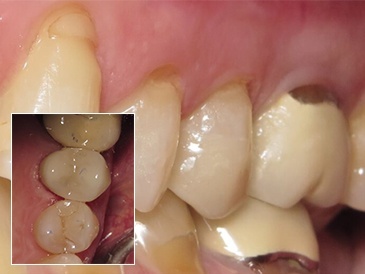 The more tooth structure saved, the stronger the tooth. CAD/CAM Porcelain Crown bonded into place showing great shade match and elimination of the margin between the tooth and crown. Can you see the margin in Fig 2? Again, a more conservative preparation means a stronger tooth and a margin that is easily cleaned by normal brushing and flossing. Our lovely patient was unhappy with the look of her front teeth and wanted a permanent fixed option after years of a Partial Upper Denture. 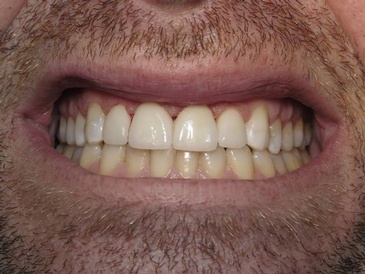 We provided a fixed (cemented) 3 unit bridge and completely changed the patient's smile and confidence. Our patient had veneers that were old, monochromatic, stained at the margins and misaligned with her natural teeth. 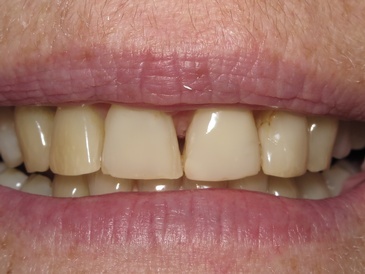 Our treatment was 4 anterior porcelain veneers to provide a symmetrical, aesthetic result that matched her natural shade while closing the black triangles between her front teeth. 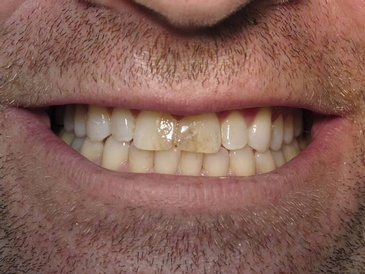 Patient presented with pain and inflammation on his front right tooth, requiring a Root Canal. 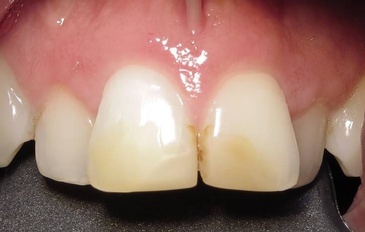 The patient’s chief concern was to be free of pain but also wanted to replace his stained and dark bonding. 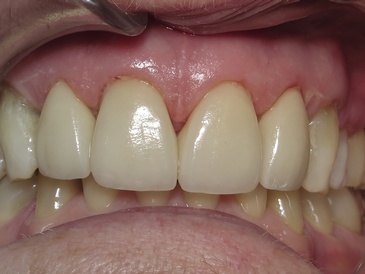 Bonding completed on both central incisors to match the shade and contour of his anterior teeth. Patient was thrilled with the final results. At the same time, a new cavity, undetected on the x-ray, was noted on the tooth in front (red circle). 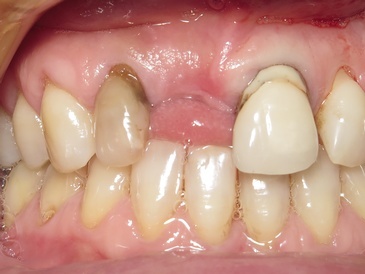 Patient consented to treating that cavity at the same time. No extra freezing or appointment required. 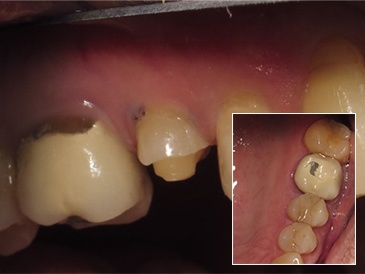 Bonded composite filling placed on the Upper right first molar. 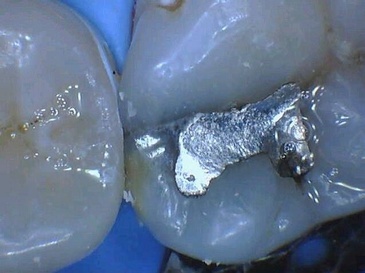 After this photo, the Rubber Dam was removed, the bite checked and both fillings were polished.